Our other currently featured books, “Murder in the Generative Kitchen,” by Meg Pontecorvo, “The Mars Run,” by Chris Gerrib, “The Color of Home,” by Rich Marcello, “Complicated Blue,” by P.J. Whittlesea and “Dreamtime,” by Alan J. Martin, can be found by scrolling down below this post or clicking on the author’s name on our Authors page. THE BOOK: Botany, Ballet and a Dinner From Scratch. SUMMARY: This is a memoir about the life of a professional dancer turned botanist and food writer. It has a strong focus on the sustainable food movement and how our food choices impact not only our health and the environment, but also our emotional and cultural well being. This new edition has more recipes than the original did, and also offers insights into how the local organic food movement has grown since the book first came out — and how far it still has to go. Plus, there are some personal updates: When I wrote the book I devoted a chapter of it to a man I’d had an affair with twenty years earlier. I had no idea at that time that I would ever see him again. He read the book, tracked me down, and now we’re married. THE BACK STORY: I wrote this book during a year-long local foods challenge in which I ate only foods grown or raised within 250 miles of my one-bedroom apartment in Brooklyn. At the time, there were bestsellers out by authors who had done similar local foods challenges: Michael Pollan’s The Omnivore’s Dilemma and Barbara Kingsolver’s Animal, Vegetable, Miracle, for example. Could it be done in a tiny apartment in a big city with a cold winter climate, limited budget and busy schedule? The answer is yes, but you’ll have to read the book to know how that worked out. WHY THIS TITLE? I was a professional ballet dancer who became a professional botanist,. and food connects the dots in the seemingly disparate aspects of my life. WHO WOULD SOMEONE WANT TO READ IT? You are curious about what it’s ljke to live the life of a professional dancer and traveler. You want to know more about how your food choices impact both your well-being and the world around you. You like to cook and especially like recipes in the style of M.F.K. Fisher and Elizabeth David. You want to read something that is both inspirational and useful. REVIEW COMMENTS: “Personal, visceral, intimate, natural and authentic. All these words describe Leda’s book. You can literally taste melancholy in one dish and joy in another. Food is nothing without context, both the context of the environment in which it is sourced and also where it fits into our memories. This lexicon of memories with cherished recipes interwoven immerses you in an enchanted storyland where you can peek into the world of art and ballet, off-the-beaten-path travel, as well as secret gardens and heartbreak. “Leda’s life is as rich and textured as her recipes. Although her stories are most likely exotic and far from many people’s common experiences, there’s something deeply identifiable and familiar, too. The longing to be free and in nature and to be sustainable and be able to cook and preserve in a modern world resonates.” — Mia Wasilevich, chef and food stylist at Transitional Gastronomy. “Oh goodness, Leda Meredith… where do I begin? What a lovely person and teacher. She is just loaded with so much knowledge and information, she’s truly a walking encyclopedia! Her writing style is approachable, witty, and just a pleasure to read. You feel like she is there with you in the room. I cannot recommend this book (and also her other ones) enough. Her message is one that invites readers to tap into where they came from, as we were living not too long ago, and sparks an interest and desire in sourcing ingredients that are growing just outside your door.” — Timothy Pakron, author of The Mississippi Vegan. 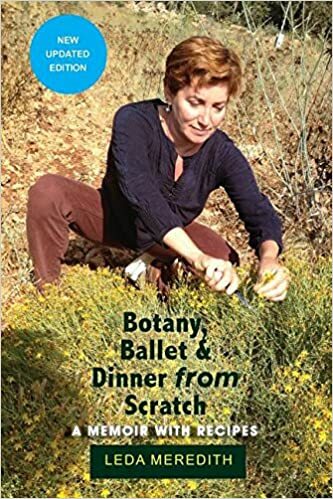 AUTHOR PROFILE: A lifelong forager (it’s her great-grandmother’s fault), Leda has been gathering and eating wild edible plants since she was a toddler. She is the author of five books, including Northeast Foraging and The Forager’s Feast. Prior to her writing career, she was a professional dancer for over thirty years, and still teaches dance and choreography internationally. Leda has been an instructor at the New York Botanical Garden and the Brooklyn Botanic Garden since 2002, specializing in edible and medicinal plants. LOCAL OUTLETS: Thee book is in numerous independent bookstores, but if you know of one that might be interested and isn’t carrying it yet, lt me know! PRICE: $17.50 paperback, $7.99 Kindle. CONTACT THE AUTHOR: ledameredith@gmail.com, also on Facebook, Twitter, Instagram and Pininterest. This book sounds incredibly interesting. I have been making an attempt at “eating better” for the past several years. It is so hard to eliminate bad habits. Maybe Leda’s book will help me figure out a way to retrain myself. Looking forward to reading this.